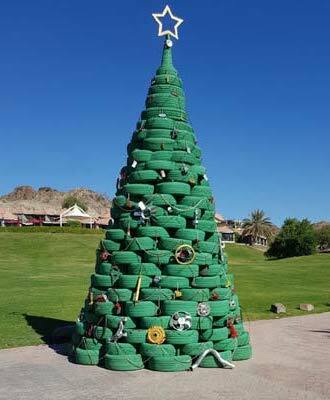 Some useful ideas so that Christmas and New Year’s festivals would not become ecological disasters. As Christmas approaches as much as 60 million pine trees will be cut down in Europe and shipped by trucks for customers to decorate their homes during the holidays, and then all of them will be discarded in 1 or 2 weeks. What would be a greener solution instead of this? It is also a great achievement if we return to the original tradition when a branch of nice pine tree was brought into the house and placed on the table or hanged from the ceiling and then decorated. The modern habit of setting up a whole pine tree for every family has started to spread in the last 150 years. Artificial pine tree is not made of the most environmentally friendly materials, but it does not involve the destruction of forests and it can be re-used for many years. In houses with a garden more and more people are decorating the living pine tree in their garden for the holidays. Meat consumption is one of the biggest environmental pressures. At the end of the year, millions of innocent animals are slaughtered all over the world for festive meals. At this time of the year in England only 10 million turkeys are slaughtered, and we have not even taken into account tens of millions of other living beings like cattle, swine, poultry, fish and other wild animals slaughtered all over the world. You can also use soya-beans or seitan to make the usual dishes. Giving gifts is a way of expressing our love, which nowadays has turned into an over-excessive shopping fever, a tendency to express our deep feelings with different commodities. We can make personalized gifts for our loved ones, or we can share experiences instead of giving objects. And if by all means, we wish to express our love through some object, it should be preferably something that is environmentally friendly (a toy made of wood instead of plastic, etc.) and useful, and will not be dumped into the trash within a few days. After the excitement of unpacking gifts, we dispose tons of plastic or paper packaging materialsthat were only used for a short time. This means a lot of plastic waste or cut forests. Instead of paper, we can use beautiful shawls or tasteful clothes as packaging. It is worthwhile to hide gifts in beautiful, re-usable gift boxes or in decorative paper bags that can be used several times. These are just a few ideas to make our upcoming holidays greener, environmentally friendlier. We wish you a greener Christmas and a Happy, Spiritually Uplifting New Year!